Only DreamDraper gives you the option to work with either full designs or design components – that’s because all of our designs are created with our exclusive BREAK-APART™ technology, so you can mix and match components exactly as you want (shown left ). BREAK-APART™ technology gives you the freedom to quickly search our Design Library 2 ways – by design or component – and choose the most appropriate style for your client’s home! start designing with one of our finished BREAK-APART™ designs – hundreds are included! or build your own creation from scratch using our vast library of components – 4,000 to choose from! Then, with just one click on our exclusive “Gold Buttons,” display all of the individual components of that design for ease of customization – or, with just one entry in our Search function, display all designs or components in a particular category – for example, M’Fay, swags, or bedding. DreamDraper is the only software that allows you to search for both full designs and individual components – you have complete freedom over what you can create for your clients! Either way, nothing could be faster or easier for you to mix and match for unlimited creativity. Whether creating fabulous elevation drawings or sketching floor plans, look in the preview window (see the illustration at left) and spot the Gold Buttons located in the corner. Just browse through the design library, find the design of your choice, click on the Gold Buttons and – VOILA! As shown at left, the browser will display all components that make up the design, including other style variations and any hardware or trim. Where applicable, the Preview and Browser windows will also display pattern, hardware, or trim company information, and other descriptions for your convenience. 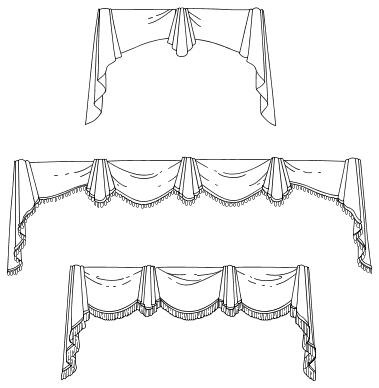 The design shown in the Preview Window at left is the Bordeaux Valance (M’Fay 9208), which includes the style variations shown below (see also the thumbnail views along with breakouts in the browser). For example, select a sofa, click the Gold Buttons, and VOILA! You will see the sofa along with its matching loveseats, chairs, sectional pieces, or even matching ottomans – Nothing could be easier! 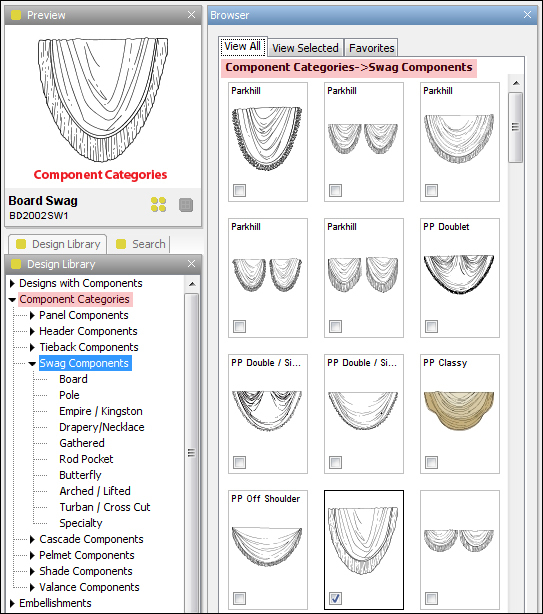 The Gold Buttons, along with DreamDraper’s exclusive Search and Favorites features, make finding your designs and components a breeze! COMPONENTS. In addition to our finished BREAK-APART™ Designs, DreamDraper comes with a comprehensive library of components for all your needs. 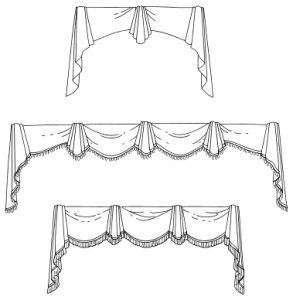 Choose from literally thousands of individual swags, cascades, panels, finials, shades, accessory pieces, and more! Remember, only DreamDraper gives you the choice! © 2017 Evan Marsh Designs, Inc. All Rights Reserved.